You reach for a fresh coconut, and take a long smooth sip of its contents, allowing the refreshing water to quench your thirst, while looking out over the crystal clear Fijian waters of Treasure Island, and admiring the intense white sand of the pristine beach. You gaze gratefully at the beautiful sunset unfolding before your eyes and breathe in the sea air, as you let the soothing voice of Diana Krall, playing on your iPod, wash over you. Out of nowhere your smartphone vibrates, indicating you’ve just made another sale of your digital program, and you check your email to see another client wants to start work with you next week. You smile, and lay your head back on the sun lounger, relax into the foot massage you’re receiving, and drift off into a beautiful slumber knowing you’re in paradise and making money..
That was reality striking your face. If this is what you think online entrepreneurs do all day then I have news for you. While it’s entirely possible to run your business and make money from a beach (and I have), what we’re really talking about here is freedom. Freedom to do what you want, when you want, with whom you want, from anywhere you want. To achieve this you need to work hard, hustle and be determined to stick it out for the long haul. You have to enjoy taking risks, and you have to persist in seeing your vision become a reality. There is no such thing as easy money, and nothing worth doing was ever easy. But, if you’re prepared to work smart and develop a laser like focus on achieving your ideal lifestyle, then anything is possible. There are just too many people out there trying to sell you on living the dream and bragging about their designer lifestyles. These people like to make it all sound so easy and then sell you on how to do it too. But I don’t sugar coat things around here. Creating your ideal lifestyle business is going to take a heck of a lot of guts, determination, will power and clarity of vision as to what you really want out of life. In reality, I’ve met more people who are either just struggling to make ends meet, or they’re working like dogs to make big money, then I have people who have genuinely built profitable businesses they love. The truth is you choose your own reality. You have to create a life and business based on your own values. For me I live by creating freedom in business and adventure in life. You may have entirely different values that define what you want to achieve in your lifetime. These values may have nothing to do with working and living from anywhere. It’s totally wonderful to stay in your own home with no desire to travel if that’s what makes you happiest – so long as you are living on purpose and loving your life. In Chapter 10 of my book I talk about the pros and cons of being a Suitcase Entrepreneur. I actually list out ten that I think are really important. Not all that I list just apply to those of us who want to travel, relocate or live elsewhere for some parts of the year. They also apply to those of you who own your own business, freelance or have a side hustle. What we’re talking about here is the good, the bad and the ugly (that very few people really talk about) when it comes to running your own show. It can be the best thing in the world but also the scariest, loneliest and toughest. Pro: Freedom to make decisions on every aspect of your life and business to fit with your priorities. Con: Dealing with the constant challenge of changing location and planning every aspect of your life and travel. Pro: Freedom to choose what hours you want to work that suit you. Con: Lack of routine or set working hours to your day. Pro: Living minimally and feeling free from the weight of possessions (both mentally and physically) so you can move around quickly and with ease. Con: Not having the creature comforts that make you feel at home, or being able to have everything at your finger tips for every occasion. As you can see, there is a flip side to every benefit you will encounter. The difference in how you view this list this will be partly based on your own outlook on life, on your propensity for risk, and on your nomadic tendencies. Don’t forget to copy and paste the URL of this blog post into your `trackbacks’ section under your blog post so we know you’ve written a response. Stay tuned for tomorrow’s blog post for Day 5 on How to create your perfect day in work and play. You’ll be asked to respond with what’s your perfect day looks like. Shawn’s goal is to do the kind of work he enjoys and find where he can be successful at that. Christian states that with true location independence, travel is life. He’s able to go where the wind takes him. Angela believes (and I agree) that it’s only once we clear away the distractions (stuff) that we’re able to discover who we really are. Sarah tells you how to do whatever you want, seriously and reclaim your fearlessness! Linda aka The Travelling Doctor says to practice location independence it takes MENTAL PREPAREDNESS, TIME and MONEY. She has 2 down, 1 more to go. Kirk has put up 30 reasons on his blog, in the shape of photos, to get out, experience the world and travel. Jade has posted her thoughts about location independence as a video. To be able to organize herself through cloud storage, internet and laptop, and working from no set office is the key. 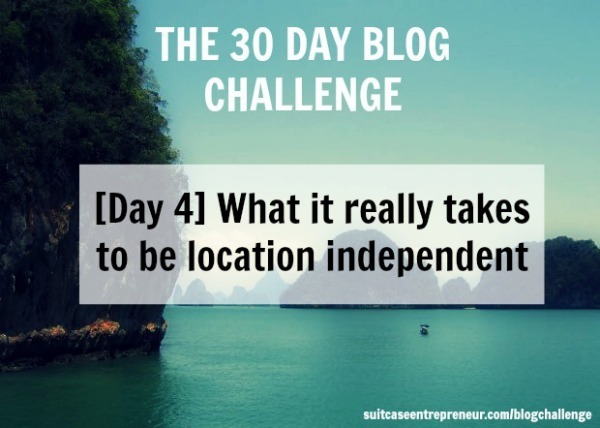 To Pat, location independence means you are free to fail, or succeed in the place of your choosing. Cheryl explains that location independence is always evolving, like when they moved to Dubai in 2001, with a 20? container, two babies and 3 large dogs! Marc discusses 3 things keeping you from location independence and asks are you ready to throw off your commitments and embrace a life of freedom? Tathra has a fascination for outdoor offices. She would like to create an office on her trampoline, and also plans to start working in the sauna, testing out guided meditations. Whitney dreams of the day when she could have a job that afforded her the time and money to travel the world and live a fabulous life blogging about it. And there a ton more in the comments.